In this bundle you will find all 5 of my Working with Vowels mini units. In these units you will find games and resources for teaching the short vowels. Your students will have fun learning and mastering the short vowel sounds while completing the activities in these mini units. This bundle is also discounted at 20% off. 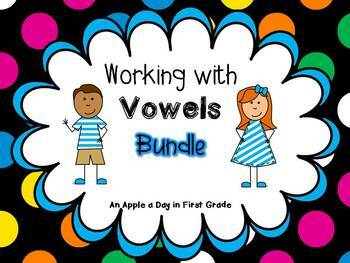 As a bonus, I've also included my Working with Mixed Vowels mini unit FREE! Yes, FREE! So, you are getting 6 mini units for the the price of 4!!!! That's a DEAL!!!! If you have any questions or concerns about this bundle, please do not hesitate to contact me before purchasing.